When schools break up, the 6 week long summer holidays stretch out before us, full of excitement with lots of plans to enjoy some much needed time off and spend “quality time” with our family. The British summer has been typically challenging this year with August set to be one of the wettest Augusts on record. By now budgets can be feeling stretched especially if you’ve already been away – home or abroad – but when the weather’s so unpredictable there are only so many arts, crafts and recipes you can bake when the heavens open. With the cost of entertaining children during the summer holidays estimated at around £389 (source – aol.co.uk) many parents face having to reign in the expenditure towards the end of the holidays, often struggling to come up with fresh ideas. From a panel of 2000 parents surveyed, children are given an estimated 13 suggestions a week of potential things to do with 1.30pm being the average time of day when children start getting bored. Days out in the UK can be pricey with tickets for many attractions starting at over £30 per person if you pre-book online. Turning up on the day can set you back a hefty £100+ each for visiting 3 or 4 places in one trip. With a family of 4 or 5, admission alone can escalate to well over £120 as well as travel, food and the pester power of the gift shop. Many big visitor attractions are based in London so when you factor in train tickets as well – even with summer promotions – keeping little ones busy across a whole day is challenging. So what’s the answer? Get a bunch of other friends and parents together and on dry days share a picnic; create a treasure hunt in your back garden or if you’ve got a tent and your garden is secure camp out and star gaze (assuming it’s a clear night); some bigger stores are still offering free workshops that may need pre-booking around pet care, or art sessions, plus many city shopping centres run free activities to encourage visitors through their doors, such as indoor beaches or free children’s entertainment. 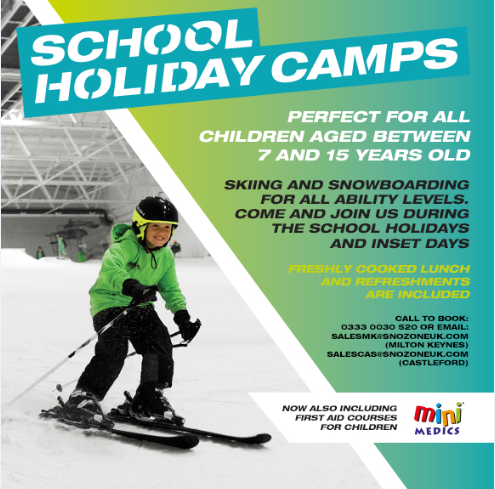 Alternatively if you want to treat the kids to something completely different and turn summer into winter with no risk of bad weather, a family of 4 can enjoy an exhilarating sledging session for just under £35.00 at Snozone. There’s also reasonably priced delicious home cooked food available overlooking the real indoor snow slopes all within easy motorway access and inside a public visitor attraction. See the Snozone family fun pages for more details. Previous Previous post: Live Twitter Q&A with our Castleford Snowsports Manager- 23rd Aug!